Located at Serra da Estrela Natural Park, in the village of Mangualde da Serra, the house das Tapadas is located on a farm, 5 Km away from the city of Gouveia and 25 Km from the highest point of continental Portugal, Torre. The house, built in granite, typical of the region, has a living room with fireplace, two bedrooms, one with double bed, another with two single beds and a shared bathroom with bathtub. This apartment also has an extra bed (sofa bed) and baby bed upon request, with capacity up to 6 adults. In self-catering basis, guests can prepare their own meals, it has a kitchen with no oven. The house has central heating. 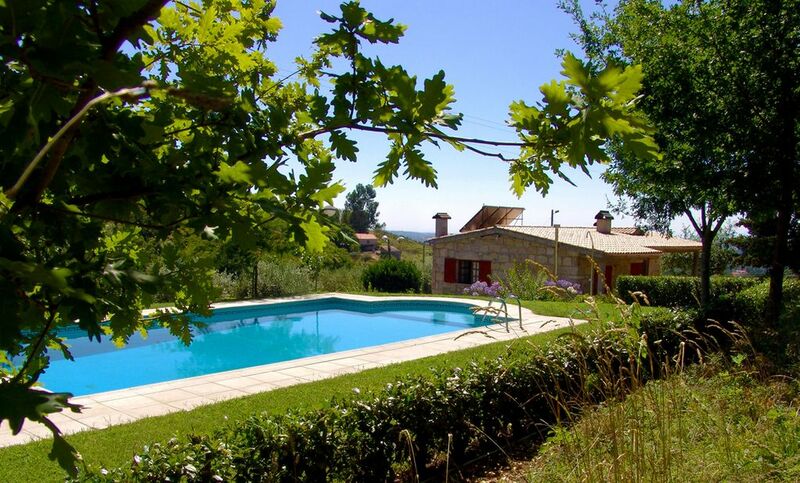 In the farm, you can swim in the pool, take walks watching birds, herds and fruit trees, with the background sound of the running water from a small stream located on the property. A calm and welcoming place for your rest..
Blankets, comforters, sheets, pillowcases and pillows are provided. The washing machine is located inside the house. Indoor fireplace in the living room. Parking on the property, outside. Hand towels , bath towels, bath mat towels and towels to use in the pool are provided. The living room has two sofas for 4 people and a dining table. The living area has 30 m2. Will be provided to guests, napkins and toilet paper. The dining area is in the living room with a table with seating for 6 people. TV in the living room, an HDMI cable is provided. Cable TV with 115 channels. Consisting of lawn around the swimming pool and green areas throughout the property. Patio with outdoor table with seating for 6 people. We really enjoyed our stay. The owner was very welcoming, with everything clean and tidy. The house was compact but had everything we needed and was perfect for spending time outdoors - admiring the views. The pool area was excellent. The location close to village had opportunities for walking and there was plenty to explore locally. A really happy week for our family. We find all we need in this lovely spot, tidy house with a fantastic private swimmingpool and view far away. Very friendly owner and family who will do everything to have a nice stay! Donos muito simpáticos e acolhedores. Casa muito limpa. Zona ideal para quem necessita descansar e "desligar a ficha"
Foi um prazer hospedar-vos. São hóspedes maravilhosos, amigáveis ​​e muito simpáticos e encontrámos a casa muito limpa. Lamentamos não terem tido bom tempo para usufruirem da piscina. Recomendo-os a todos os futuros anfitriões e serão bem-vindos sempre que assim o desejarem. Bem-hajam! Casa num local muito sossegada. Proprietário muito simpáticos. Casa muito limpa à chegada e com direito a um miminho! Primera vez en la sierra de la estrella y no sabíamos qué esperar… Al acercarnos nos dimos cuenta de que la zona es especial, una naturaleza exuberante con olivos y viñas con vistas que nos encantaron. La propiedad es enorme y tiene unas vistas espectaculares, tanto desde la casa como desde la piscina. La casa es preciosa y tiene todo lo que podríamos necesitar y más (Internet va muy bien, lo usamos para trabajar). Una sorpresa muy agradable fue la calidad de todo en general. La ropa de cama y las toallas eran buenísimas. Lo que más nos gustó fue la atención que nos brindaron. Siempre dispuestos a ayudar y a satisfacer cualquier necesidad. Un atención al detalle y una disponibilidad absoluta para todo. Una estancia maravillosa!!! Muchas gracias Isabel, José y Paulo, no tenemos palabras para acabar de agradecer la hospitalidad con la que nos tratasteis. If you want to explore the area, you can enjoy the mountain hiking visiting lagoons (with a tour guide if you want), visit diferent museums (bread museum, automobile miniature museum, toy museum, one interpretation center about the Serra da Estrela Natural Park), go kart, play tennis, visit one small zoological park with animals from the region , visit the highest poin of continental Portugal 25 km away. Or if you prefer to rest, enjoy a pleasant bbq with family and friends in the house..